Welcome to the David Lab Website! The David Lab at UC Davis utilizes numerous tools of chemical biology to explore the complex mechanistic details of DNA repair enzymes. DNA repair proteins such as MutY and NEIL, among the targets of research of the David Lab, help catalyze necessary repair of oxidative DNA damage, and are critical to maintaining genomic integrity in organisms living in the oxygen-rich environment of Earth. The David Lab is headed by Dr. Sheila S. David, who has led at the forefront of DNA repair research for over 25 years. The David Lab continues to push forward the world’s current understanding of DNA repair enzymes by leveraging our unique expertise in DNA repair enzymology while venturing into new areas and collaborating with scientists around the world. A recent publication from the David, Siegel and Lim (Academia Sinica, Taiwan) labs (Nuñez et al., JACS, 2018) provides insight into the coordination sphere and critical role of a Zn2+ metal binding site in the DNA repair glycosylase MUTYH. Genome database mining and sequence alignment of MUTYH orthologs, along with computational modeling, identified and supported Zn2+ ligation by four Cys residues. Click to read more. New work from the David Lab examined the selective base excision repair of DNA damage by the non-base-flipping DNA glycosylase AlkC, which primarily targets N3-methyladenine (3mA). The authors shed light on how DNA glycosylase AlkC is able to selectively locate and repair its target substrate as AlkC wraps and kinks its target DNA, why it does not allow for bulkier substrates, and more. Click to read more! MutY, remarkably, is able to specifically recognize and initiate repair of target OG:A mismatches from among a vast sea of natural DNA. To help reveal molecular features of OG that are critical for MutY recognition, this work explored the effects of systematic OG:A substrate alterations on MutY recognition in a cellular context. OG analogs were synthesized, assembled into OG:A modified oligonucleotides, and were subsequently analyzed using binding, enzymatic, and cellular repair assays. Click to find out more! In this work, the iron-sulfur clusters of DNA repair glycosylases Endonuclease III and MutY were examined using S K-edge X-ray Absorption Spectroscopy (XAS) in order to investigate DNA binding and solvation effects on Fe-S bond covalencies. Results were compared to data obtained from previously studied model complexes such as ferredoxin (Fd) and high potential iron-sulfur protein (HiPiP). Click to read more about changes in Fe-S bond covalency using EndoIII and MutY protein models. Maddy with Sheila after receiving the 2019 Francesca Miller Undergraduate Research Award. Liz and Savannah present their research at the 2019 Miller Symposium Poster Session. Holly says goodbye to Sheila and Chandrima. Listen in while Chandrima Majumdar explains this recent work from the David Lab, which was selected as an ACS Editor’s Choice article. For the latest David Lab updates, check out the News section. Click on Research for an overview of The David Lab’s research. A thorough list of publications is available in the Publications section. t the News section. A thorough list of publications is available in the Publications section. 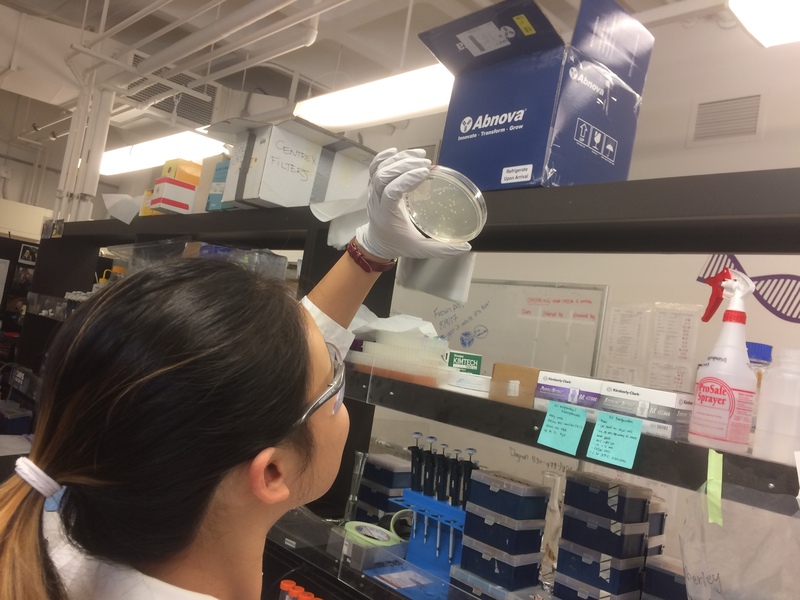 Chandrima inoculates bacteria culture during her MutY protein preparation. Robert pours fractions during purification of his crude compound using flash column chromatography. Liz is preparing to image her gel, as part of an enzymatic activity assay which utilizes radiolabeled DNA. Undergraduate researcher Sunbal is preparing reagents and dilutions to set up for a kinetics assay with her graduate student mentor Nicole. Kori is pipetting the necessary reagents into a well plate for her fluorescence-based enzyme activity assay. Cindy inspects for colonies of transformed bacteria strain E. coli. Undergraduate Researcher Ellen Chu runs flash column chromatography on a modified nucleoside. Introducing the David Lab Graduate Student Spotlight! Check out our conversation with Nicole as she discusses her journey as a Ph.D. student working in the David Lab.